#DiversityBingo2017 starts on January 1, 2017, and this is definitely the challenge I am looking forward to the most in the new year! The goal of the challenge is to cover all of the squares during 2017. 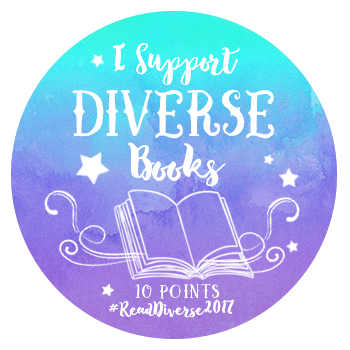 Although I don’t have books chosen for all of the categories yet – and some of my book selections might change categories – I do have a few in mind already. MC of Color in SFF – Where the Mountain Meets the Moon by Grace Lin. Review here. Black MC (Own Voices) – The Underground Railroad by Colson Whitehead. Review here. Indigenous MC (Own Voices) – The Absolutely True Diary of a Part-Time Indian. Review here. PoC on the Cover – Ms. Marvel, Volumes 2 – 5 by G. Willow Wilson. Review here. Practicing Jewish MC – Dawn by Elie Wiesel. Review here. Bisexual MC (Own Voices) – Of Fire and Stars by Audrey Coulthurst. Review here. Book by Author of Color – The Hate U Give by Angie Thomas. Review here. D/dEAF/Hard of Hearing MC – El Deafo by Cece Bell. Review here. Own Voices (Transgender) – George by Alex Gino. Review here. MC W/an Under-represented Body – Will Grayson, Will Grayson by John Green and David Levithan. Review here. Free Choice: Milk and Honey by Rupi Kaur.